Note: I noticed that UnionBank made some changes for the application of EON card. Thus this article was updated to reflect those changes. Last week, I tried to purchase a book using my Paypal account. The problem is that I can't purchase the book because Paypal is preventing me because I haven't linked my account yet to any credit or debit card. I tried, in vain, to use my BPI ATM Card as a debit card so that I can finally verify my Paypal account. Even though my BPI ATM Card a VISA logo on the back, Paypal can't accept it for verifying my account. I called BPI customer service and they said that they don't have special arrangement with Paypal so my BPI ATM Card can't be used to verify my account. I discovered that only Unionbank is the only bank in the Philippines that has special arrangements with Paypal. In the Philippines, only Unionbank's EON Card is accepted by Paypal as a debit card that can be used to verify Paypal accounts. Because of this, I was forced to apply for Unionbank EON Card. 1. Unionbank EON Card Application form – This can be downloaded from Unionbank's website. This is also available from any Unionbank branch and you can fill it up when you apply for Unionbank EON Card. 2. One photo-bearing valid ID. You can see the list of valid IDs this page of UnionBank's website. 3. 350 Pesos – This is the fee that you have to pay when applying for Unionbank EON Card. I went to the Unionbank branch near my office. I told the Unionbank teller that I am applying for a Unionbank EON Card. I was given an application form, which I filled up. Also, the Unionbank teller will ask for my IDs, which she photocopied. The application for the Unionbank EON Card is done after filling up the application form. I did not paid the application fee yet. I paid the application fee after I got my Unionbank EON Card three days later. Applying for Unionbank EON Card is easy and I got my EON Card within the week. According to the teller, the waiting time for the Unionbank EON Card depends on the number of people applying for Uninonbank EON Card. It is good that only few people are applying for Unionbank EON Card that's why I got my card after three days. Now, I am ready to verify my Paypal account and buy that book. I guess that not having being an SSS member is not a problem. They just use it as a way to verify your identity. If you don't have an SSS or GSIS account, then you can just use any government-issued ID when you are applying for an EON card. I am not sure with TIN. The government collects taxes from what we earn from bank accounts. This is the reason why bank asks for our TIN. I suggest that you inquire at Unionbank regarding this issue. Hope that helped you. Have a blessed day. I am not a customer just yet. I wanted to be your customer as I have read very good reviews about UnionBank. Unfortunately, the service I have received earlier this afternoon is not only unacceptable, it IS my WORST experience in Philippine Banking Customer Service. Because of this, I chose not to transact with you anymore and chose to NOT RECOMMEND you to any of my fellow freelancers. I am a freelance outsource worker from oDesk. I am paid weekly through remittances from a company in the US and am considering to use UnionBank EON to accept my weekly salary. I submitted my application and thoroughly read your EON card policies and requirements. I was told to claim my card in the branch I chose. I picked UnionBank Richville, Alabang Branch as I am familiar with its location. I was directed to be helped by CECIL R. MARCELO. I was greeted with an unfriendly face and a snobbish demeanor. Anyway, I presented 2 valid government issued IDs (requirements to claim the card per your directions online) and I filled out a form. When CECIL saw my permanent address in the application form- that is different from my address in my IDs, she rejected my application with an unfriendly tone after numerous questions about my work and why I needed the EON card. I felt as if I am not qualified to use your bank's services because I am a freelance worker. What made it worse is, during the whole "transaction" she did not even smile. To tell you honestly, I didn't expect that a reputable bank will be provide such poor customer service. 1. It did not necessarily specify on the site that you needed IDs that bear my permanent residence address/ address that will be placed in the application form2. It did not say on the site that applying for an EON card will also include an interview with a teller/customer service rep. I could have taken things lightly if only I was greeted and informed by a friendly face and tone. People I know will be informed of this unsatisfactory service that you provide. just want to ask what if I don't have a company id? all I have is sss number ,tin number a philhealth card. Will this suffice for application? I believe that not having a company ID is not a big issue becase EON Card is just like any bank account. I suggest that you provide them with two government-issued IDs. Also, please contact Unionbank and ask them about it. The processing time for my EON card application is three days from the day I submitted my application form and complete requirements to Unionbank. When I linked my Paypal account to my EON account, I waited about 24 hours up to 48 hours. I can't recall the total processing time of account linking but I think that I didn't went beyond two days. So, the total processing time is about 5 days. What are the difficulties that you are encountering in verifying your Paypal account? Cannot verify my rcbc mywallet on Paypal. they disabled entry from it and it can take 7-10 business days for them to enable it again (too long!). Looking for something that can get me through this verification at the soonest time. Then I suggest that you try Unionbank EON card. Hope your problem gets solved the soonest time. thanks for the info. It is well written and easy to follow. You are welcome Burn. Thank you for visiting my blog. Hi, i just wanna ask if in applying for UnionBank EON card, is there any balance requirement in opening the account? except for the P350 fee that you have paid. ps. i really need your reply. Thank You! The 350 pesos fee is the annual fee for maintaining your EON account. It has no maintaining balance thus it is OK even if your account has zero peso. Be reminded, though, that you need to pay 350 pesos yearly so as to keep your EON account "alive". 350 Pesos lang ang kailangan mong ilabas na pera para makapag-open ka ng EON account sa Unionbank. I applied for eon card last wednesday, and i am planning to cancel the application. Is it possible? Would they require me to pay the 350 application fee? Thanks! Yes. You can cancel your application. You can call the UnionBank branch where you sent your application and tell them you want to cancel everything. You don't need to pay 350 pesos because you cancelled your EON account application. i plan to get eon card. what are the requirements beside from id? ID is a requirement. 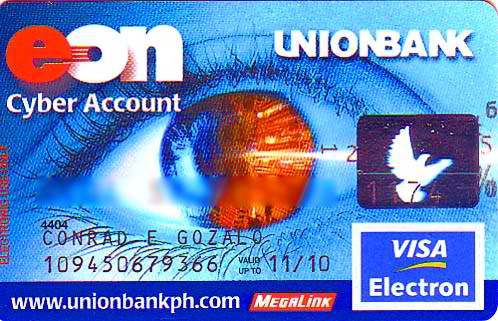 I am not sure if Unionbank will allow you to obtain EON card if you don't have any ID. I suggest that you go to a Unionbank branch and ask if they will allow you to apply even if you don't have ID. Please read my blog post again to see the other requirements for EON Card. hi, i just want 2 have an eon card. I dont have any bank account. I have only TIN ID and philhealth id. I have sss number but no card yet. No company id too. Can i get one? coz i need it for business purposes. Tnx reply asap. Don't have other ID's that contains your photo? I believe that Unionbank needs ID with photo so as to connect your face with your name. one of the requirements in their site is proof of billing,,Did they ask you for that? Because i dont have one.. The Unionbank staff didn't ask me for the proof of billing. I think that they need this document so as to verify your address. I suggest that you bring other document that contains your address if you don't have any proof of billing. sir ask ko lng po kung pwede ung student id? ung lng po kc ung valid id na meron ako? Government issued IDs are preferred pero kung 'yan lang ang ID na meron ka eh posible na tanggapin na din. Go to a nearest Unionbank branch and ask for info. Good day! i want to open an eon too but i am not YET working, just a student. would that be a problem? Should I bring my mom/dad when I apply? lol Thanks! No need for you to bring your Mom and Dad. The only problem that you will encounter, I think is your TIN. Do you already have a TIN? as a student, what are the requirements for applying EON..i dont have any TIN or SSS but i have a driver's license id..
i am only a student but i want to apply for a EON card and i have only 1 valid ID..will that suffice the requirement?? I visited the UnionBank website at wala na sa requirements ang TIN at SSS. Ok na yang Driverse License mo. Yes. You 1 valid ID will suffice. I noticed na kahit student ang ifill out mo nagtatanong parin ng nature of employment at employment details. Bakit and how should I go with that? Lagay mo na lang sa "Nature of Work/Business" ay student. Ok na iyan. Basta lang magkaroon ng laman yung field. disable po ako but i want aply eon card i work online so i need it.. avail it though i dont have any id's?? You need to have valid IDs when applying for EON account. Unionbank will reject you application if you don't have any valid ID. I didn't experience the problem that you experienced. The best way that you can do is to go to a Unionbank Ph branch and ask them to fix your problem. Hi, I want to apply for EON card, but i don't have SSS/TIN/UMID number, and I'm not a student anymore, I just graduated and currently working online jobs, I need to withdraw my funds in paypal.. so what should i put in the application form? Just tell the Unionbank staff that you don't have the TIN yet. They might allow you to have an EON account even if you don't have TIN. I applied earlier and chose the employed status, when I went to union bank mandaluyong branch earlier I was advised to present my company ID and barangay clearance. I can provide a baranggay clearance but I can't provide a company ID since I already resinged. The ID's I preseted are my philhealth ID and passport. so the big question is, how am I supposed to get my eon card? So I applied for an EON card earlier today, received a text message with the reference number and an email confirmation. after that I went directly to union bank shangrila-st.francis, the teller there told me to present a company ID and a baranggay clearance as a proof of residency in pasig. I presented my passport and philhealth ID.The bad thing is I dont have a company ID to present since I already resigned. So, how am I supposed to go with this? What you can do is tell the UnionBank staff that you just resigned from so you cannot submit any company ID. Hi, can i edit my application form? Kase i put there wrong address or should i cancel nalang and apply again. Thanks.. I had read on union bank website that valid id.s are are required including your proof of billing. But I do not have any proof of billing to show them. Can I still have eon card? Proof of billing is just used to proof of your home address. Maybe you can ask UnionBank about other documents that can replace the proof of billing. Hi ms charmprincess..it's been a year now na di ko nagamit yung eon card ko at wala na sya laman. i'm planning to close the account na. i'm wondering if they gonna charge me for the penalty fee of 200 pesos since no transaction for a year now (bale ika 13th month na this month na walang transaction). sisingil pa din ba ako ng penalty fee kahit ipaclose ko na sya? pwede lang ba tumawag sa unionbank para paclose yung account? i'll appreciate your response po. thank you. Hindi ko po alam kung anong penalty kapag matagal nang hindi ginagamit yung EON account. Ang hula ko ay parang katulad din yan ng ibang ATM account. Kapag matagal nang walang laman ay nagko-close account. Isa pa ay kapag nag-expire na yung EON card ay posibleng mag-close na din yung account. I suggest na tawagan mo muna yung UnionBank. Tanungin mo sila tungkol sa concern mo. Huwag kang magbigay ng identifying data kapag tumawag ka. hello can i avail eon card even if iam still a student but i have an valid i.d to represent only proof of billing that i dont have can i still open an account? I think you can still apply for an EON card. Regarding to the proof of billing, maybe you can ask UninonBank if they allow other documents to prove your residence. Proof of billing is just use as proof of your residence. I'm a student and I went to unionbank and tried to ask to open an account for eon to verify my paypal and also I completed my requirements but the staff ask me a lot of question for what of purpose and what will I do in paypal and transaction. What will I say? Just say that you need a Paypal Account because you need to purchase via the Internet.